Quarter after quarter, the solar industry grows more and more, but never like this. The solar industry just experienced its largest quarter ever with more than 4,143 MW of PV installed, according to SEIA & GTM Research’s Q4 Solar Market Insight report, which provides third quarter data. The booming utility-scale solar market accounted for roughly 70 percent of this growth, particularly in California, which became the first state to ever install more than 1 gigawatt of utility PV in a single quarter. This record-breaking quarter brings the total nationwide solar capacity to 35.8 gigawatts, enough to power 6.5 million U.S. homes and reduce carbon emissions by 41.7 million metric tons annually. How did the industry grow so much in just a few months? A new solar project was installed every 84 seconds, culminating in a new megawatt every 32 minutes. That is about the same as 125 solar panels every minute. And with another record expected for the final quarter of 2016, we will hit 14.1 gigawatts of new capacity for the year, an 88 percent increase from 2015’s total. Expansion and growth of burgeoning state markets helped drive this record-setting quarter. Utah is now a member of the “Gigawatt Club” with more than 1.2 GW installed, joining California, North Carolina, Arizona, Massachusetts, New Jersey and Nevada. North Carolina has been shooting up the state ranks, and has taken over the #2 spot for total capacity from Arizona. 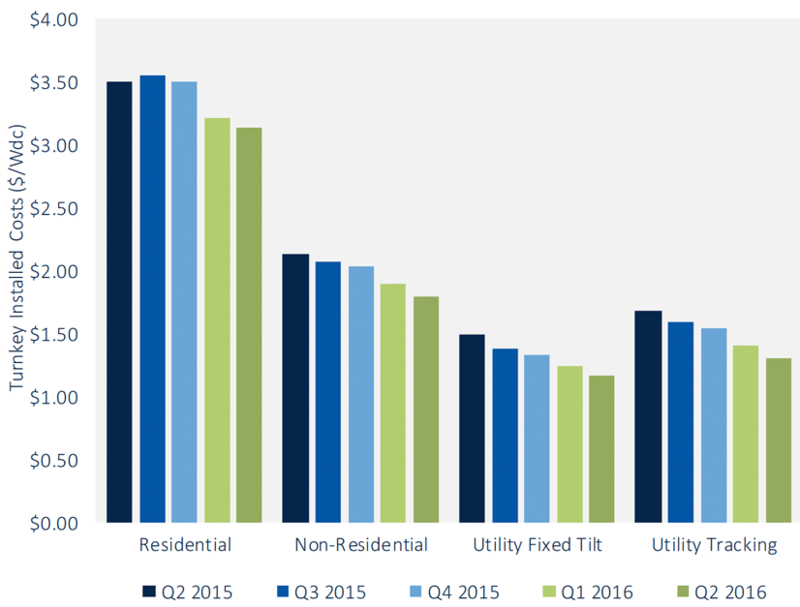 Through Q3, solar accounted for 39 percent of all new electric generating capacity brought online in the U.S. This impressive growth has been driven by 14 states that have each installed more than 100 MW so far this year. 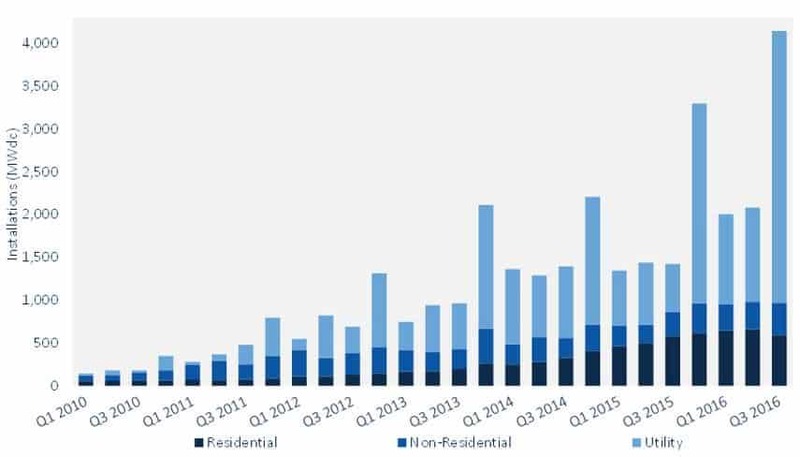 Community solar added more capacity than the segment installed in all of 2015, supporting the second-largest quarter ever for the non-residential PV market. Average pricing for residential rooftop systems fell below $3/W for the first time ever. As the industry matures, we will continue seeing records broken and costs falling. This quarter’s growth sets a benchmark for the industry to strive toward and grow past on its projection to nearly quadruple by 2021. The state of solar continues to strengthen, and proof of that can be found at seia.org/smi.